A mountain lion dubbed the "Culvert Cat" for how it navigated two of Los Angeles' busiest freeways has been found dead, the victim of the devastating Woolsey Fire that ignited in November and destroyed 1,500 structures and killed three people, officials said. National Parks Service officials, who captured the mountain lion earlier this year and fitted it with a GPS tracking device before releasing it into the wilds of Southern California, had initially thought the animal had survived the wildland blaze, which ignited on Nov. 8 and burned nearly 97,000 acres. But a team of biologists from the National Parks Service set out last week to look for the mountain lion, also known to wildlife researchers as "P-64," and discovered its remains in the Simi Hills area of Los Angeles County, officials said. 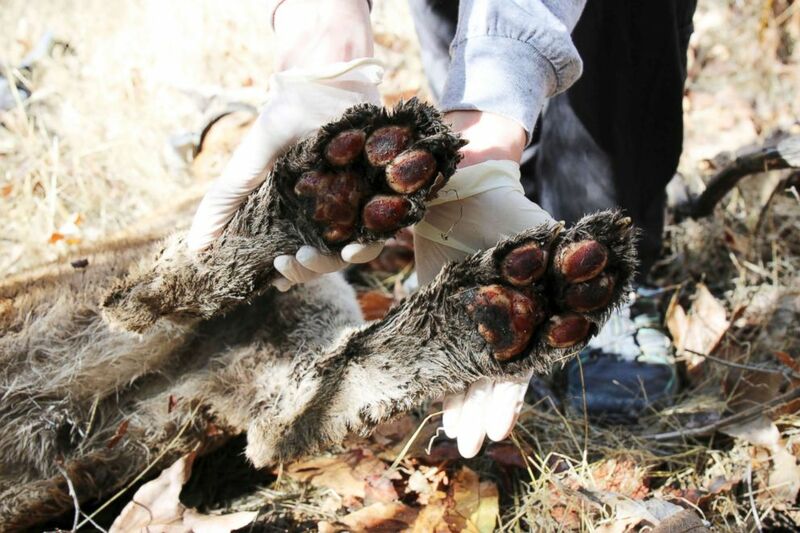 This Dec. 3, 2018, photo provided by the U.S. National Park Service shows the burned paws of a mountain lion known as P-64, a 4-year-old male also known as the "Culvert Cat," in Simi Hills, Calif.
"Our biologist hiked into the location of the last GPS point on December 3 and found P-64's remains nearby. He appeared to have been dead for a few days," National Parks Service officials said in a statement. The Culvert Cat's paws were badly burned, said officials, who believe the animal survived for several days before dying from injuries he suffered in the blaze. "P-64 was a fascinating cat to study because he crossed our notoriously deadly freeways dozens of times," said Jeff Sikich, a biologist for Santa Monica Mountains National Recreation Area. "It's very unfortunate that he was seemingly so successful surviving in this fragmented landscape and then died in the aftermath of a devastating wildfire." A necropsy will be performed on the carcass by the California Department of Fish and Wild Life to determine an exact cause of death, officials said. Wildlife experts captured the big cat, believed to have been about 4 years old, in February and fitted it with a GPS collar to track its movements. The mountain lion was nicknamed the "Culvert Cat" after surveillance cameras positioned on foot trails recorded the animal repeatedly crossing Highway 101 and Highway 118 via an underground culvert in the Liberty Canyon area northwest of downtown Los Angeles.